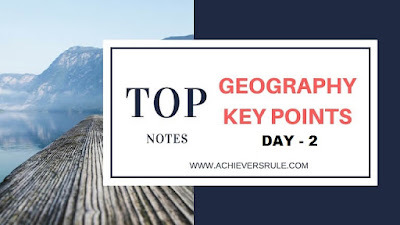 Here We Listed all important Topics of Geography Hand Written Note down Points from which basic tricky questions were frequently asked in SSC, RAILWAY, NDA and Other Government Competitive Exams. Today is the 2nd Day of Geography where we covered the major types of Rocks, Volcanoes, Mountains, Etc. Major Mountain Ranges of the World and 5 Layers of Atmosphere. The solid part of Earth’s crust is known as Rocks. Generally Rocks are of three types i.e. Igneous Rock, Sedimentary Rock and Metamorphic Rock. Igneous Rock – This type of rock solidified directly from the molten silicates (Magma). Here are some Igneous Rock. Sedimentary Rocks – This type of Rock is formed when Igneous rocks are eroded as a sediment under sea. Here are some Example of Sedimentary Rocks. Metamorphic Rocks - The nature of igneous and sedimentary rocks changes due to the effects of tremendous pressure or heat and new transformed rocks. Here are some Examples of Metamorphic Rocks. It is the vibration in the earth’s crust. The earth’s crust is made of different parts of various sizes (plates). Movement of the plates is the main reason of earthquake. Richter Scale and Mercally Scale are used to measure the magnitude and intensity of earthquake respectively. The branch of Geology that deals with the study of earthquake is known as Seismology. Circum Pacific Belt, Mid Atlantic Belt and Mid Continental Belt are the main zones of earthquake. It is the opening of earth’s crust and is connected by a conduit to an underlying magma chamber. Molten Lava, volcanic gases, stream and other pyro-classic materials are ejected from the magma chamber. There are three types of volcanoes. Not erupted several centuries. Ex. St. Arthur’s Seat (Edinburgh). The uplifted portion of Earth’s surface is known as hill or mountain. Mountains are classified into four types. i.e. Block Mountains, Fold Mountains, Volcanic Mountains and Residual Mountains. These are extensive upland areas characterized by the flat and rough top surface and steep walls, which rise above the neighbouring ground surface at least for 300 m.
Plains- It is a relatively low lying flat land surface with least difference between its highest and lowest points. Atmosphere- It is a mixture of a layer of gases enveloping the earth. The gases held to it by Gravitational Force. The atmosphere extends to about 1000 Km from the surface of the earth but 99% of the total mass of the atmosphere is found within32 Km. Composition of the atmosphere are Nitrogen (78.09%), Oxygen (20.95%), Argon (0.93%)and Carbon-Di-Oxide (0.03%) etc. Carbon-Di-Oxide is an important constituent of air as it has the ability to absorb heat. As a result, the atmosphere becomes warm and the heat of the earth is balanced. It contains 90% of gases. The temperature at Tropopause is about -57Degree Celsius. It is 18 Km at Equator and 8 Km at Poles. Vertical decrease in temperature at the rate of 6.4Degree Celsius/ 1000M. This layer has great significance for plants, animals, human and microorganisms. It lies above the Tropopause (50Km in Equator). It has Ozone Layers that absorbs ultraviolet rays. The temperature ranges between 57 Degree Celsius and 0 Degree Celsius. It lies above the Stratosphere. Its height is up to approximately 80 Km. The temperature decreases here with height and falls to about 100Degree Celsius at 80Km height. It extends from the top of Mesosphere to about 600 Km above the earth’s surface. The temperature increases greatly with height reaching up to 2000 Degree Celsius at the top of the layer. It extends from the top of the thermosphere to about 10000 Km above the earth’s surface. The temperature in this region range from 300 Degree to 1650 Degree Celsius. Satellites orbit the earth in this layer.